What can a dog owner do to reduce summer shedding problems that leave dog hair on everything? 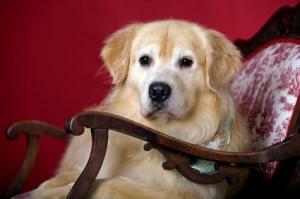 Guest columnist Wendy Nan Rees recommends her favorite grooming tool to remove loose dog fur. I have come to terms with the fact that when we own our beloved dogs, they come with some responsibilities besides regular feeding, housing, and vet visits. They also come with extra hair that seems to be everywhere but on our dogs. All joking aside, my three boys seem to have the problem of shedding all year long. The constant weekly hair vacuuming, using my homemade hair remover almost daily on my clothes, bedding and all the furniture in the house becomes a big job. The FURminator® is a shedding tool that is made of a special shedding blade that will not cut your dog's skin. It easily removes the loose and dead undercoat that is normally hard to get to. The non-cutting blade is made of stainless steel; it gently goes to the undercoat and does not touch the top coat. The handle is made of a black rubber sure-fit grip to help you remove the loose fur from your dog. This is a must if you have a dog that sheds, for I promise after using this tool for a week that you will find less and less hair daily, and your dog's coat is going to become beautiful. This amazing grooming tool comes in four sizes, and you can now find it online, on the shopping channels and at almost every pet store. It was invented by a groomer who saw the need for everyday dog owners to be able to address yearly coat blowing as well as daily shedding that we all have to deal with unless you have a dog that does not shed. My dog Cappy does not shed, but my Lab Senny was shedding hair daily until I started to use this tool. Now, I no longer have to vacuum every day, nor do I have to use sticky tape to pick up all the hair. Of course, my boys still shed, but it is so much less, and this is why I wanted very much to share this tip with you. That is the good news, but you are going to still have to bathe your dog yourself or take him to a groomer to have other things done. Please remember to use a good flea and tick repellent as well as a good shampoo and conditioner. It is important to make sure your dog's ears are cleaned and his teeth brushed. I like to make this a fun summer outside activity on Sunday with all three of the boys, and they love water so it just makes my life easier. Remember, diet will also play a role in how your dog's coat looks and the amount of fur that is shed. It is important to be sure your dog is healthy and on a good diet, especially if his hair loss seems more than normal. If shedding lasts for more than a few weeks, it is time to see your personal vet.